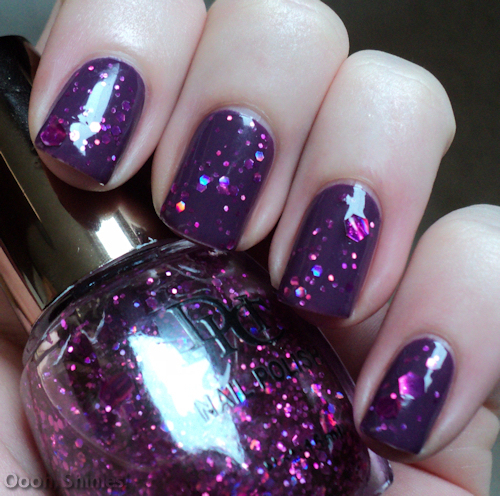 One of the items that I got was a glitter polish, with different size glitters in a clear base. On the site it looked pink/purple, but the glitters are actually a bit holographic, with red and blue popping up the most. I only remember seeing this one and a blue version, but I checked their site earlier and they have it in a lot of different colors now. The large glitters are hard to polish with, I kinda dabbed them onto my nails, but that's normal with this kind of polish. 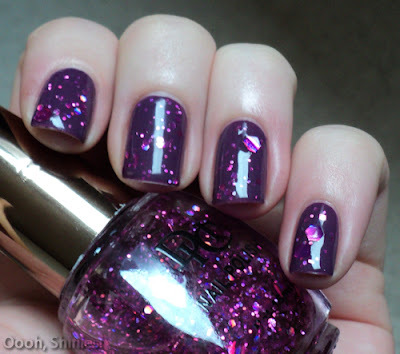 Here I'm wearing 2 coats of Catrice Plum Play With Me, 2 coats of number 063 glitter polish, and a coat of Seche Vite. Usually I wrap the tips of my nails with SV, which I didn't do now and as a result I got a little bit of shrinkage. I also received a 7-way nail file/buffer block, it has a funky shape which I wanted to try out. I had a quick go with it now and liked it, the shape made it comfy to handle. For filing of my nails I always use a glassfile, but for buffering I'll use this one next time. Next up are Nail Polish Removal Pens. I usually use the light pink ones from Essence, I find other brands' tips hard to work with and I haven't found a brush yet that I find easy to use for cleanups. I do dip the pens in remover and wipe them off in between so they last longer. The pens that I received have the same shape tip as the Essence pens, only they're quite a bit harder which took a bit for me to get used to. Because of that they seem to take the polish up a bit less good as well (I only tried it with the above mani though), but I wipe the polish off the tip anyways. They do stay in shape longer thanks to their hardness, so that's good. The pens also come with 3 extra tips per pen. 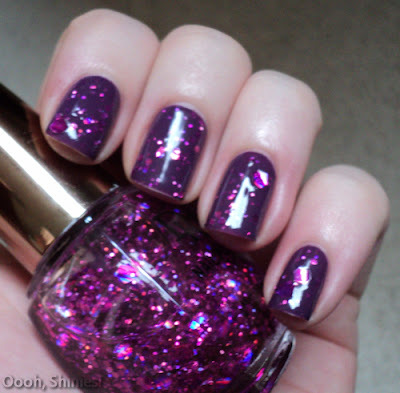 You can buy these items at Born Pretty Store, the glitter polish number 063 costs $3.89, the Nail Polish Removal Pen cost $4.66 per 5, and the 7-way Buffering Block is $1.53. You can get their Hello Kitty plate for free by using code BP299. I also received some stickers and a crackle polish, I didn't have one of those yet so I'm excited to try it out :) But that's for next time, enjoy your weekend!